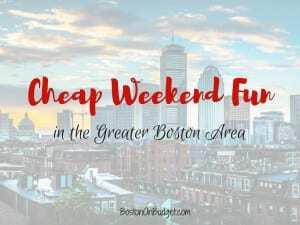 Cheap Weekend Fun in Boston for August 4-5, 2018! Boston GreenFest: August 3-5, 2018 at Boston City Hall Plaza and Faneuil Hall. Enjoy this annual green festival with entertainment, local food trucks, activities, and much more! St. Agrippina di Mineo Feast: August 2-5, 2018 in the North End. Head to the North End this weekend for the St. Agrippina di Mineo Feast on Hanover and Battery Streets. Dine Out Boston: August 5-10 & 12-17, 2018. Enjoy Boston’s Restaurant week with fixed menu prices at your favorite restaurants. Shakespeare on the Common: July 18-August 5, 2018 at the Parkman Bandstand on the Boston Common. Enjoy your last chance to catch a free performance of Richard III at 8PM and 7PM on Sunday nights and a special matinee at 3PM on Saturday. National Oyster Day: Sunday, August 5, 2018 at Back Bay Social Club. Celebrate National Oyster Day at Back Bay Social Club with $1 Oysters, live music, giveaways, and more! Magic 106.7 Family Film Festival: Every Saturday from July 7-August 25, 2018 starting at 6PM. Enjoy a free movie under the stars in the courtyard of the Prudential Center with a free screening of The Incredibles starting at dusk. Movies in the Park: Every Saturday from July 7-August 25, 2018 at Sylvester Baxter Park in Somerville. Head to Assembly Row for a free outdoor movie with a free screening of Jumanji: Welcome to the Jungle starting at dusk. Sunday Night Movie Night: Every Sunday night from July 22-August 26, 2018 at Christopher Columbus Park in the North End. Enjoy a free outdoor movie screening of Chariots of Fire at dusk.